This is my first impression of the Jane Davenport Butterfly Effect Book. 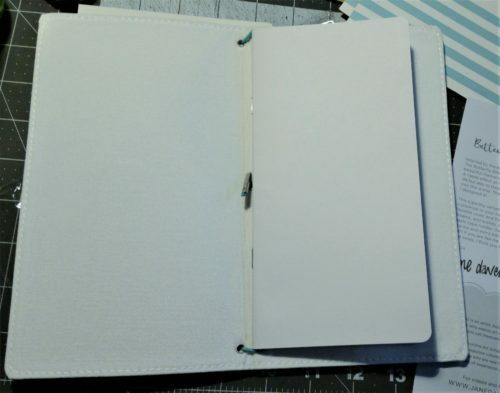 Also known as a traveler’s notebook or Fauxdori, or one of many other names for a version of the Midori Traveler’s notebook- an ingenious take on an old fashioned version of a binder. If you want more info on the original Midori notebook system head over to my friend Patrick Ng’s blog Scription. Patrick really took the Traveler’s notebook to the next level with ingenious marketing and gorgeous photography. He’s a master and an amazingly nice guy. As much as I have always loved the Traveler’s notebook system I’ve never been able to spring for one. US$50+ for a flap of leather with some holes punched in it and some elastic always seemed a tad high, especially when I can head to eBay buy myself a large chunk of leather for $50 and make myself a full sized Traveler’s notebook as well as a few Field Notes sized. Which is the great thing about Patrick and Midori, they have always embraced the DIY esthetic, in fact when Patrick saw an image of my own boiled bucked skin version of the notebook he told me I shouldn’t denigrate it by calling it a knock off. In the end I don’t use my Field Note size Traveler’s notebook, it no longer fits my needs. But my friend Jazmin pointed out that Michael’s is now carrying the Butterfly Effect Book(BEB)- a true knock off of the traveler’s notebook. 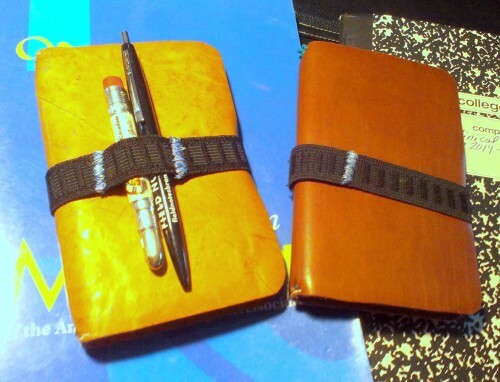 This one fits the bill for people who don’t want to buy leather and who want to be able to decorate their notebook in wild and fun ways that you might not wish to do on leather*. Moving on. 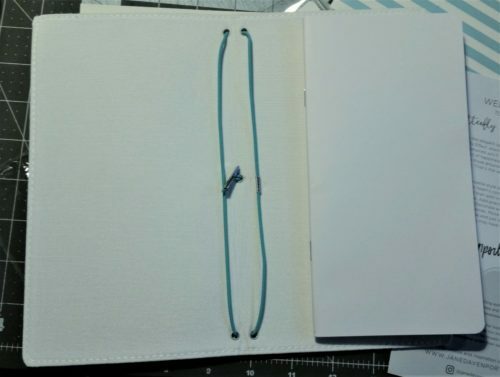 Inside the BEB package you get the white nylon canvas cover, a 16 page insert of unknown paper type, elastic closure and a single large book holding elastic. 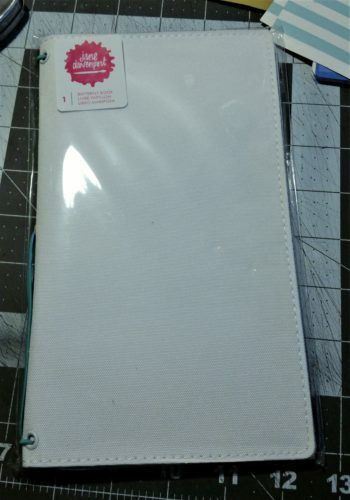 First the cover is white nylon. I know this because a corner was frayed and I was able to sear it with a lighter to keep it from continuing to fray. It melted easily. It also feels like nylon. There are two pieces of nylon with what feels like thin cardboard sandwich between them and then stitched. From a little flexing and how the canvas moves on the outside but not the inside, the cardboard is glued to the inner canvas but not the outer. This makes sense from a bookbinding standpoint. If you don’t glue the inner fabric it’s going to bunch in ugly ways. The holes for the elastics are while painted eyelets. The eyelets on mine are well finished on the outside but the inside the aluminum shows through the paint. The closure elastic feels sturdy and is nice and thick. The interior elastic is too thick and the same thickness as the closure elastic. Further if you want to paint the exterior of your cover you will need to remove the interior notebook holding elastic by cutting it, or risk getting it covered in paint. Since it is so thick, I’m going to cut mine and replace it with thinner 1/16th elastic to create less of a bulge in my notebooks. Of course my local Michael’s didn’t have the full range of add ons so I was not able to get any differently colored elastics. The only color available was light teal. Luckily I adore teal. Overall, this cover is a value if you plan on decorating the inside and outside with acrylic paints and don’t want to use leather. At $13 MSRP it’s not a bad price. However the line is subject to Michael’s coupons which range from 60% to 25% off. I picked up mine for 60% off or $5.53, which is a killer deal. Would I pay full price? Probably not. For the same price you can also pick up a line of pre-decorated covers with Davenport’s cutesy version of Suzi Blu/Willow/Insert another online instructor’s “girls.” these may not appeal to many people outside her “Davenpeeps.” I didn’t make that up, apparently that’s what she calls the people who follow her online. I certainly would not buy her inserts which are highway robbery and aren’t even the right Midori size of 11x21cm or 8.5×4.5 inches, they are 8×4 inches. Overall a fun experiment for under $6. 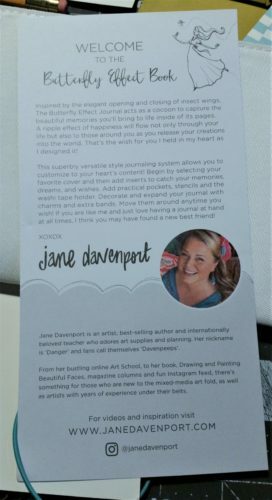 This entry was posted in Review and tagged BEB, butterfly effect journal, davenpeeps, jane davenport, travelers, travelers notebook on 20170128 by leslie.